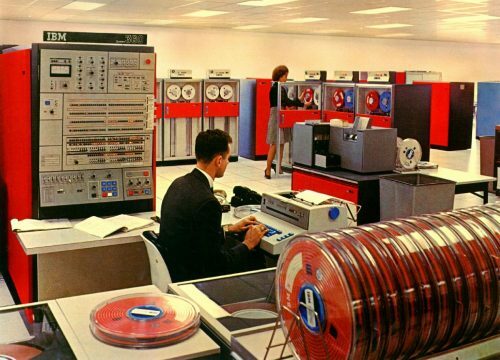 Yesterday saw the 50th anniversary of the IBM System/360 mainframe. This was a major change in the way computers were used and are still being used to this day. This change was a quantum leap in the way computers were used and constructed. Before the System/360 were built, when they needed upgrading they were thrown away and a new one built in its place. With the System/360, if you needed more storage you went out and ordered a bigger one. More speed? Get a processor upgrade. Printers, users were just the same. Just upgrade the bits you needed as the rest is fine. It wasn’t only a hardware revolution. It was software one as well. Before the System/360 you wrote programs for your computer, if it was upgraded then you wrote them again for the new system. In the heady days of the 60s, when Kennedy had told America they were going to the moon by “the end of the decade“, the System/360 came along at the right time. Amazingly fast, for the time, and agile for the calculations that were needed to get a rocket to the moon. Micro – one that you can carry. Now the mini-computer and micro have merged into one and then split into desktop, laptop and netbooks to name but three. These machines needed a lot of space as well as power. You have to remember that in those days we didn’t have the surface mount technology we have today so they were big! Not only that, there were drive units as well as tape drives so data could be backed-up and stored in case of disaster. 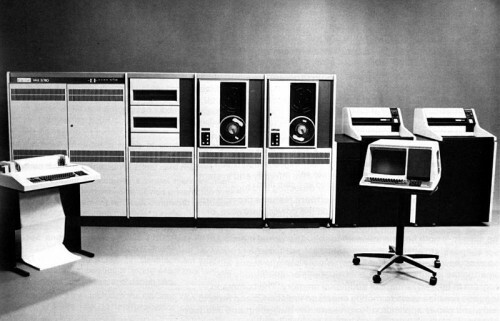 Mainframes are still in use today. They are great at doing a lot of small things quickly and readably. From when you withdraw money form a “hole in the wall” to the Met Office supplying forecast data. Even in the 21st century we are using these old workhorses that a lot of us thought they were put out to pasture years ago. Simple, representative, tasks done quickly and readably then this sort of system is for you. I first encountered mainframes a quarter of a century ago at Liverpool Polytechnic who had several Digital VAX clusters. Wonderful machines that you could do so much on. We had eMail, we could talk to and contribute to projects with VAXnotes. We could even transfer useful programs from Lancaster University’s HENSA archive. A FTP site that holds lots of memories from the people who used it. “H99” has a semi-mythical status but that could be a story for another day. This piece has a sad end. There are no working System/360s in existence today. There are very few systems that weren’t destroyed when the customer upgraded to a newer system such as the System/370 or when the computer came to the “end of its life“. Many were scrapped in this way and its precious metals recovered. One of the reasons that many of the System/360s weren’t saved is the physical size of these early mainframe systems. They are huge. They take over a large room and use a huge amount of power to run. Not only that, they are hard and expensive to maintain – you have to remember that a lot of the people who maintained these systems in their heyday are now in their 70s and 80s so we need to gather these peoples histories of using and running these historic systems so we can, one day, see these behemoths running. Happy Birthday WorldWideWeb. 25 years young.